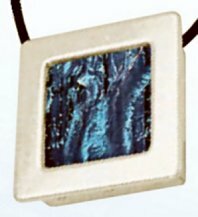 Gallery Pendants are available in four styles. All are solidly constructed and plated with .999 pure silver. Slide your fused piece into the frame, thread jewel chain or leather jewelry cord through the top and you have an amazing finished piece. There are three holes at the bottom of each frame. Hang crystals or beads to add detail and interest. Change your insert at any time to match your mood or attire. Pieces that fit the square pendants will also fit the round pendants. Swap back and forth! 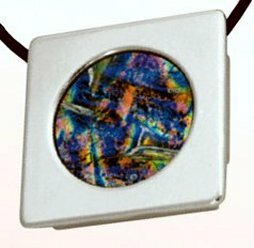 Pieces that fit the oval pendants will also fit the rectangle pendants. Swap as you like! Fits pieces that measure 1" x 1½" x 1/4" (6mm) and 5/16" (8mm) thick. Two choices - the 5/16" option is great for heavily textured pieces or multilayer creations. The opening in the Gallery Pendant might be too big for your piece of art. If this is the case consider using a small piece of cork to fill the space and as a cushion your precious art. 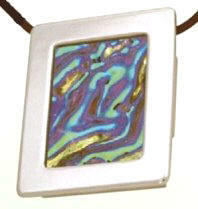 Or consider putting 2 pieces of glass in the Gallery Pendant. You can then change the art quickly. Occasionally the face of the Gallery Pendant might be a little loose. It’s easy to fix. 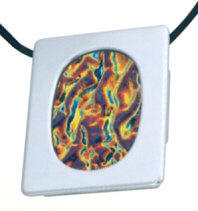 With the front of the Gallery Pendant off use your thumbs to lightly spread the sidewalls of the back box. (It won’t bend easily) This slight movement will be enough to give it a tight fit.